Compassion for Yourself. Being part of a chronic illness community, we often find ourselves sharing kind words with others who are struggling. We send virtual hugs, healing thoughts and/or prayers, and we let each other know that support is available. We see ourselves through the eyes of our friend who is in pain and try to bring comfort and understanding to them. But what about yourself? 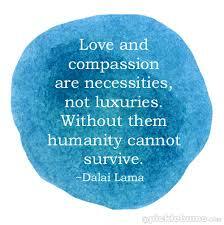 Do you have compassion for yourself? Do you treat yourself as you would a friend? Do you say loving things to yourself and remind yourself to be get the sleep and care you deserve? My guess is “No.” We tend to feel angry towards our bodies and are stubborn about continuing life as we did before our symptoms appeared. For some reason, the rules aren’t the same as they are for a friend in need. Today, show yourself compassion. It doesn’t mean you are weak. It isn’t a luxury. It is a necessity. I have never been good at forgiving myself. I wish I could but I just never have. I hope everyone can allow that of themselves. Life is better when we can do that.